Treatment time includes 30 mins of LHE PR, plus cleanse, mask, scalp massage, eye serum, serums, moisturizer and spf. *Series packages are available for all LHE Photo Rejuvenation treatments. What is LHE Photo Rejuvenation for Anti-Aging? This treatment delivers beautiful results with a new proprietary energy technology. 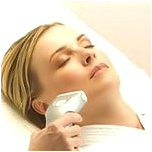 A valid alternative to Laser and IPL treatment devices. Ideal for clients who wish to have progressive results with no down time, no irritation, and no peeling! This technology uses both Light and Heat Energy to affect the dermis, but is virtually painless. LHE helps with reduction of hyper pigmentation (brown spots), wrinkles, enlarged pores, acne scars and rosacea. It is gentle, but does set up an injury in the skin in order to stimulate healing processes and collagen production. Usually 6 to 8 treatments are recommended to gain the best visible results. The Best Facial in Orange County!